« Is the EPA Trying to Destroy Rick Perry’s Texas? And the drought in Texas goes on . . . 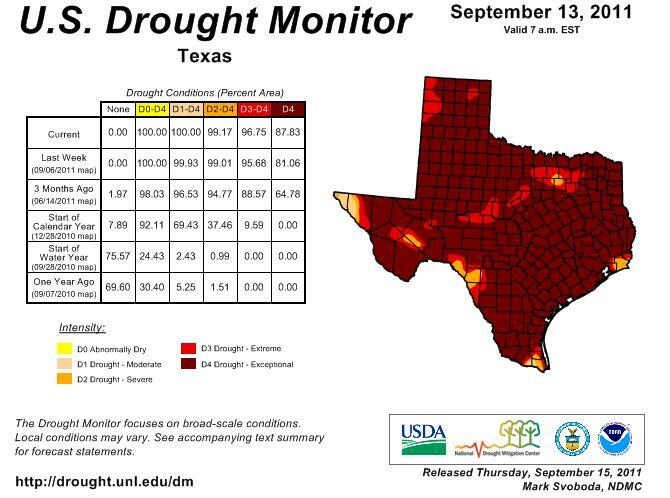 The drought in Texas that has fueled wildfires, devastated agriculture and caused water shortages, actually worsened in the past week according to the US Drought monitor’s weekly report. Much of Texas would need 9 to 23 inches of rain over the next month to emerge from drought and that is unlikely to happen. The forecast for three months out indicates that we will stay in this pattern for a while. Texas was told to expect abnormally warm and dry conditions from October to December thanks to another La Nina weather cycle. La Nina conditions in the U.S. tend to mean warmer, drier weather in the south and the U.S. Climate Prediction Center said Thursday that over the next three months above normal temperatures are expected in Colorado, Kansas, New Mexico, Oklahoma and Texas — as well as parts of areas along the western Great Lakes. While some rain fell Thursday morning in parts of hard-hit north Texas, nearly 88 percent of the state is in what is classified as exceptional drought — up from 81 percent the week before. Nearly 97 percent of Texas is in either exceptional or extreme drought. From June through August, Texas suffered the hottest three months ever recorded in the United States, according to the National Weather Service. And the 12 months ending on Aug. 31 were the driest 12 months in Texas history, with most of the state receiving just 21 percent of its annual average rainfall. In Texas alone, agricultural losses have topped $5 billion. Over the next few days, some 1-2 inches of rain is forecast in some of the drought areas. But Texas will miss most of that, so no relief in sight. At least the temperatures have dipped below 100, so while the Austin City Limits festival will probably seem unbearably hot for those coming into Central Texas from out of state, for us Texans 95 degrees will seem balmy.